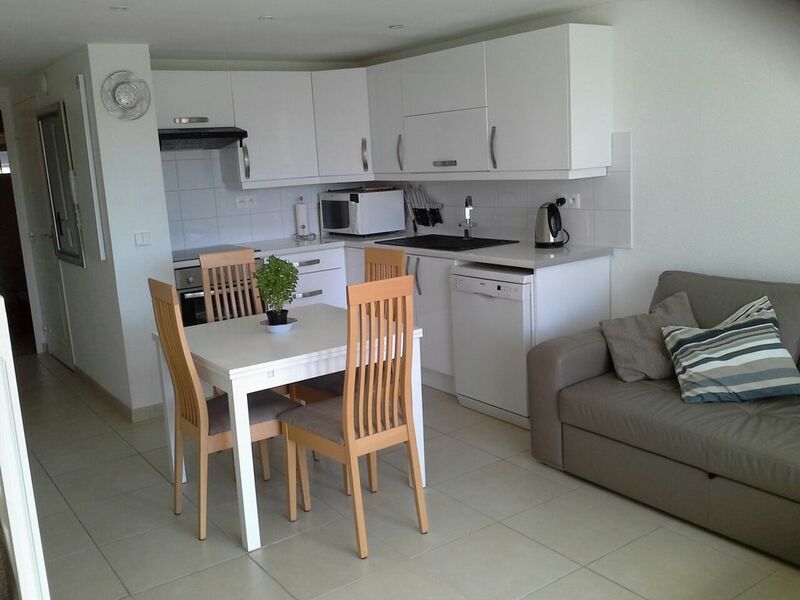 Modern 2 bedroom 2 bathroom, fully air conditioned apartment in Port Grimaud. I live in the west midlands but originate from Yorkshire I am married to Pete and have three grown up children and three grandchildren. We have many years of renting our Apartment and are always very pleased to help and hope all of our guests enjoy their stay. The Apartment has access to a private swimming pool for owners and guests to the Apartment. with toilet facilities in the poolside area. The Apartment has its own private parking area directly opposite the main entrance. The Apartment can be accessed via a ramp and lifts and makes it an ideal location for anyone less mobile, and disabled parking is also available outside the main entrance. Bathroom one has a toilet, Shower, Hand wash basin, and heated towel rail. Bathroom two ( En-suite) has a Toilet, Shower, Hand wash basin, Heated Towel rail, and washing machine. There are air conditioning units in the Living area and both bedrooms. Conversion Heating and extra Electric oil filled radiators are available in the Apartment. Linen and Towels are provided for your stay but the owner must be notified of how many people are staying in advance. There is an extra charge of £15.00 per person for over 4 people for Linen etc. Clothes airers are available for your use. One parking space directly in front of the main entrance. Living area has a Leather settee that converts to a double bed or can be used as a single bed. The dishwasher is full size. The apartment has two fridges so no problem keeping your wine or beers cold, both have a small freezer compartment. The Microwave is an oven, grill and microwave combination. The Dining table seats 4 persons but will extends to seat more people if required. On the balcony there is a table and 5 chairs and a sunshade if required. There is a lift to the second floor which is large enough for a wheel chair. There are ramps from the car park to the main entrance. There are parking areas specifically for disabled guests and owners. The Communal pool also has sunbeds available to our guests and there are toilet facilities within the pool area. Thank you Sarah for your lovely review We are so glad you enjoyed your stay. Very charming apartment,owners very friendly and helpful,close to bus route,bars and restaurants.would not hessitate in booking this apartment again. Thank you so much for your review we are pleased that you found everything in the Apartment ok and glad you had a good holiday. Doesn't get any better really, fully equipped, spotlessly clean. Had a lovely stay at this apartment in August. Swimming pool was great as was the location of the property. Would definitely stay here again on our next visit to PG! I am so glad you enjoyed your stay and hope you will visit us again. very pleasant, well equipped, homely apartment. Spent a very pleasant 10 days here over Christmas. The apartment was worm and comfortable, Julie was very helpful in providing everything we needed for our stay. The weather this time of year is surprisingly good, usually between 10 and 20 deg. ideal for walking and cycling. St. Maxime and St Tropez are still lively during the daytime. We would be happy to stay here again in the near future. This is an excellent apartment. Thank you so much Paul and Lorraine your views and that of all of our customers are very much appreciated. I have never been at Christmas time as we have other Apartments in Austria in Ski areas but nice to know others are enjoying our summer holiday home. This is a follow up to my review of 2 years ago, this year my wife had an accident slipping on a step at the Petit Beach (formally Residents Beach) and broke her ankle. This was the 14th July so we still had 2 weeks of our holiday left, we just bought a wheelchair moved to the downstairs bedroom and used the downstairs shower and toilet (how useful is that). We were able to get the wheelchair all around the downstairs rooms and out on the terrace to sit in the sun, access to the apartment was easy via the sloping walkway and lift, so the accident did not spoil our enjoyment one bit thanks to this versatile apartment.. We have already provisionally booked our 2015 dates as we do not want to loose our precious slot for our 5th year of holidaying In this excellent apartment. Thank you Ron & Karen for your wonderful review it is very much appreciated although we have never met I feel like I know you after so long. I was so pleased that Karen`s accident did not spoil your holiday too much, except I suppose swimming was not on her list of things to do!! I look forward to hearing from you later on in the year. In the meantime take care and I hope all is now well with your Karen. Port Grimaud is a city built on water France`s own little Venice, with it`s many waterside restaurants and bars and weekly markets within the Port and neighbouring towns and villages. Port Grimaud offers the option of a gentle boat ride around its waterways or you can take the water taxi into nearby St Tropez or St Maxime. The golden sandy beach, hypermarket, crazy golf, and summertime funfair are all within walking distance of the accommodation. Visit Gassin the pretty village with it`s panoramic views of St Tropez and its beautiful bay, and delightful cafes. Visit St Tropez with its beautiful port and see the artists at work all around it, visit the fabulous shops, harbour bars and restaurants and enjoy the captivating night life. All booking will be confirmed once a reservation fee of 25% of the full rental has been received. Full payment will be required 8 weeks before date of arrival. A Security deposit of £150.00 will be required and returned in full once keys/car pass are returned and confirmation from the Cleaning company has been received that no damage has occurred to the property or contents. Payment can be made in sterling or euros.